This rustic style handcrafted accent table features a distressed wood top with a hand-applied oil finish. The top is constructed from reclaimed solid wood planks that are edge glued for a durable and attractive surface. This distinctive table has a custom made wrought iron base with a wide choice of finishes to choose from, including hand painted colors and natural rust patinas. 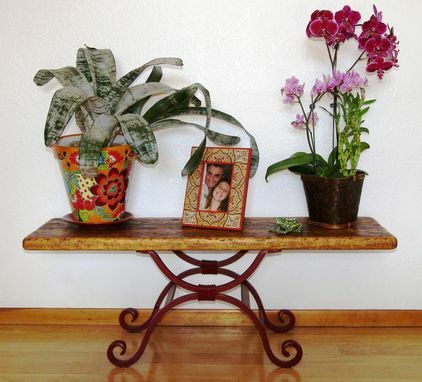 This occasional table is ideal for use indoors to display photos, decorative pots, and more; or use it as a patio or garden bench to show off your pots and plants. For outdoor use, we recommend applying a polyurethane coating or using an outdoor specific wood stain/finish. Just contact us regarding options or with any questions. - Custom made to order. Please contact us for details.